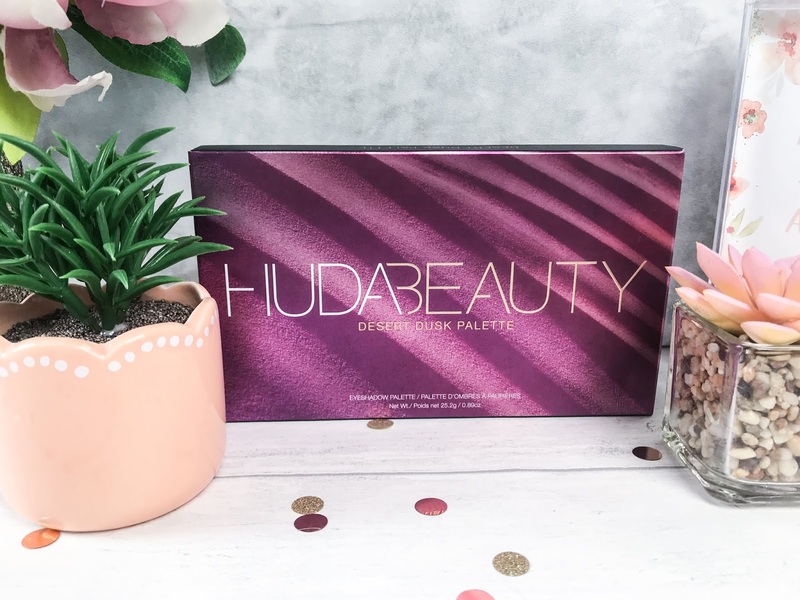 One brand I am always lusting after is Huda Beauty - when it comes to makeup I much prefer to see them in ‘real life’ before making a purchase, however I know of nowhere near me which stocks the brand so I am always in limbo as to which products to buy. 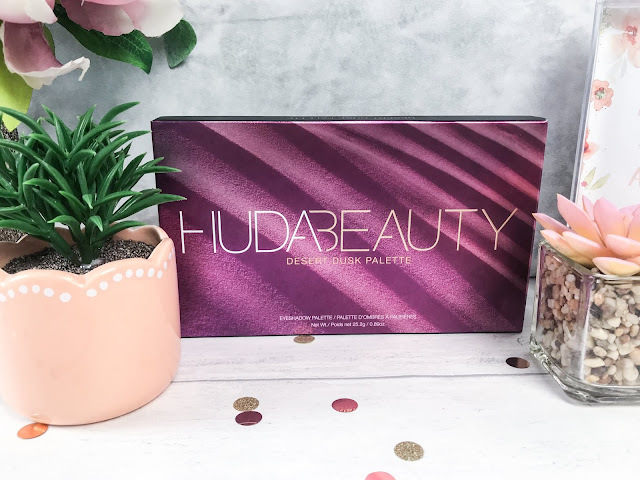 However, I recently ordered a Cohorted Treat Box which came with the Huda Beauty Desert Dusk Eyeshadow Palette, and so I have finally been able to try out one of Huda’s amazing palettes - hurrah! 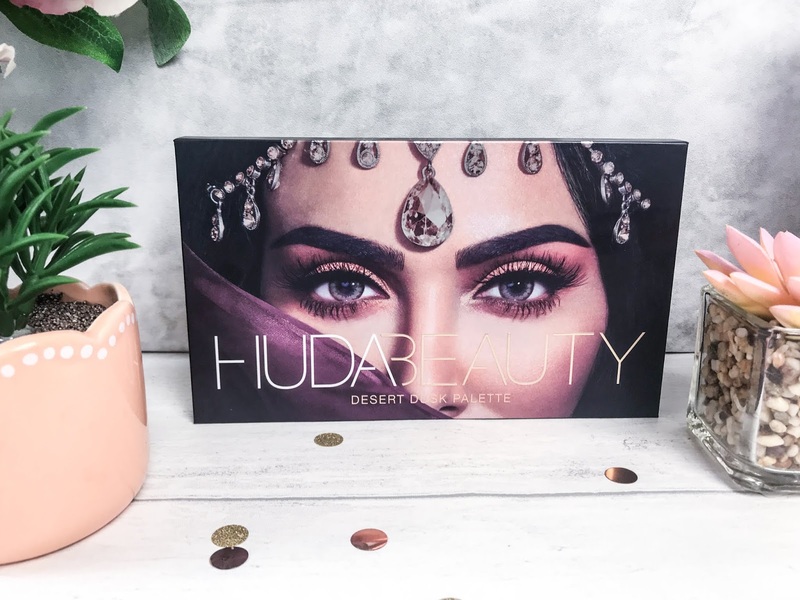 The palette itself comes beautifully packaged, in a metallic box, with an ethereal print of Huda on the front of the palette, which opens up to reveal a full-sized mirror on the inside of the lid, which is magnetised, so that the palette doesn’t randomly open up in your handbag or luggage, and of course those 18 oh-so-stunning shades. The Desert Dusk Palette has been created by taking inspiration from Arabia, encapsulating shimmering dunes and the iridescent, shade-shifting light of a desert at dusk. Desert Sand: A soft, light-medium yellow with warmer, orange undertones and a matte finish. Musk: A muted, medium taupe brown with subtle, warm undertones and a mostly matte finish. Eden: A brighter, medium orange with warm undertones and a hint of pink and a matte finish. Amber: A medium-dark brown with warm, red undertones and a mostly matte finish. Blood Moon: A rich, medium-dark copper with warm, red undertones and a metallic finish. Oud: A muted, dark plummy brown with warm undertones and a matte finish. Celestial: A dirty, medium brown with warm, golden peach undertones and gold-to-pink duo-chromatic sparkle. Nefertiti: A medium gold with warm, brown undertones and a sparkling sheen. Twilight: A bright, medium lavender with warm, pink undertones and a sparkling, metallic sheen that shifts from bluish violet to a warmer pink. Amethyst: A medium-dark, magenta purple with warm, pink undertones and a mostly matte finish. Royal: A medium-dark, plummy brown with warm undertones and lighter pink pearl. Retrograde: A rich, coppery brown with green-to-blue shifting sparkle. Cashmere: A medium taupe with warmer undertones and a metallic sheen. Angelic: A light-medium pink with cooler undertones and a warmer, golden shimmer on top. Cosmo: A medium-dark copper with a glittery finish. Turkish Delight: A rich, cranberry red with warm, copper undertones and a metallic sheen. Saffron: A muted, medium-dark red with warm undertones and a mostly matte finish. Blazing: A rich, medium-dark orange with warm, red undertones and a mostly matte finish. Due to such a variety of shades and finishes, this palette can work all year round, and it is pretty hard to choose a favourite shade. 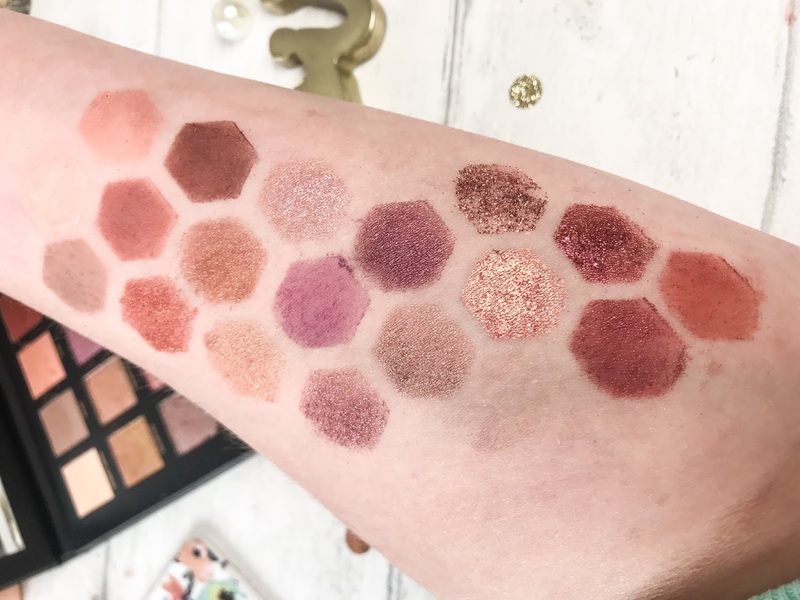 However, Eden is definitely a favourite as I am loving peach-toned makeup at the moment, Blood Moon, Celestial and Nefertiti are super pretty and shimmery, and I think these would be great for parties, but also great for wearing with a tan. 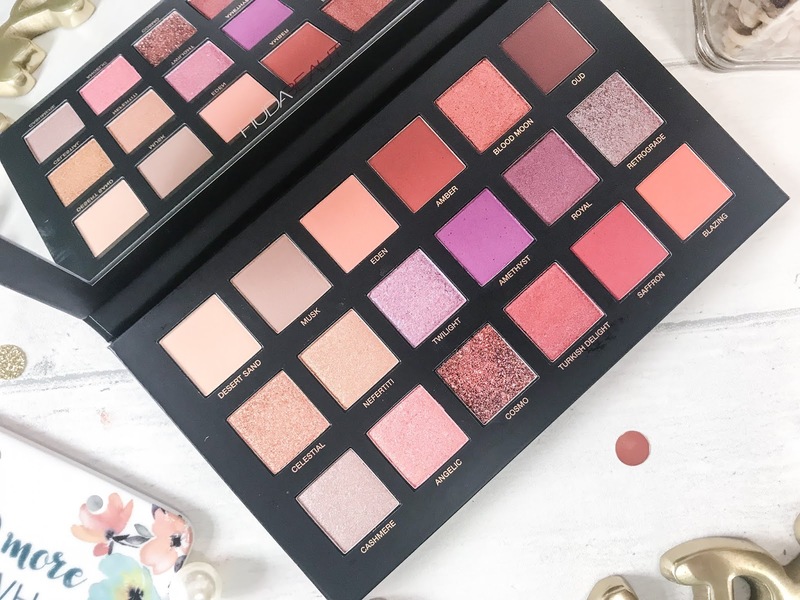 I can see Saffron and Blazing are going to be firm favourites for Autumn eye looks, and a combo of Turkish Delight and Cosmo looking insane! The Huda Beauty Desert Dusk Palette costs £56 and is available at Cult Beauty and Selfridges.